Go to Manager/Setup > Hotel Control Files Setup > Rooms. "Room number" can be up to four characters and should be numeric if you have any interfaces such as call accounting or anticipate interfaces in the future so that minimal remapping is required. When you set up new rooms, you will see a message, "GARMAST.FIL Record not found." That means this is a new record. Just press Enter or click OK.
"Description" can be up to twenty alphanumeric characters and is a brief summary description of the room. "Rates" can be set up for each room or they can be set up for each room type and then updated to individual rooms with one button. To set up individual room rates without importing them from the room types setup, use this grid if you are NOT using the Season Record. If you have seasons setup, then click the 'Season Rates' button at the bottom of the Room Setup screen where you will be prompted to enter a season code. Each season's rates are set up separately. "Weekend (+/-)" is the ADDITIONAL amount that should apply on days defined as weekends in your Season Record. To add twenty dollars to the nightly rate, enter 20. To subtract twenty dollars from the nightly rate, enter -20. To use percentages for weekend rates, edit MENUINI.FIL appropriately. For weekend rates, you must use dollar amounts or percentages; not both. "Room type" is the four-letter room type code for this room. The codes can be any letters or numbers you wish but should be fairly easy to identify and remember such as QQNS for Queen/Queen non-smoking or KJKC for King with Jetted Tub, Kitchen, facing the Courtyard. All rooms must have valid room types. If you are using Execu/Tech's Catering and Events software for space or venue booking, you must set up meeting or banquet rooms with room type CONF. Each of those rooms must be designated CONF. You must not use CONF otherwise. "Room Status" should be set to VC (Vacant/Clean) when setting up Execu/Suite for the first time. The status will change automatically as rooms are checked into, cleaned, set out of order, etc. It is unnecessary ever to change the room status once you have started using Execu/Suite. "Comment" can be up to twenty characters. The first ten characters will display on the tape chart. "Maid Station" can be up to three characters. If maid stations are designated for rooms, the Housekeeping Report can optionally print by maid station. Most hotels do not use the maid station setting since housekeeping assignments vary from day to day. "Search Priority" determines how often this room will be selected when the 'Find' feature is used in room assignment at check-in or reservation. The higher the search priority, the more often the room is selected. This feature is not necessary and rarely is used. "Room Nights Used" should be set to zero when using Execu/Suite for the first time or you can enter the actual number of room nights this room has been occupied prior to installing Execu/Suite. This information is used when the "Find" feature is used in room assignment. The system will select lesser-used rooms first. This information also is used when the Tape Chart is set to C (condo mode) in the Parameter Record so that lesser-used rooms display before higher-used rooms on the Tape Chart . "Room rate 'Multiple persons' number (default 2)" sets the number of persons allowed in a room before the 'Extra persons' rate applies. The default is 2, meaning that the Extra person rate will apply to the third and each additional person in the room. If this field is set to 4, then the Extra person rate will apply to the fifth and each additional person. "Include in Count?" defines whether this is an inventoried room or non-inventoried room. If set to Y will include this room in inventory and will be considered in the total number of rooms of this type available. If set to N this room will be considered a non-inventory room. A Parameter Record setting determines whether non-inventoried rooms display on the tape chart. If you are setting up boat slips or RV spaces you should place a U in this field if you need to enter water and electricity meter readings for charging the guest. 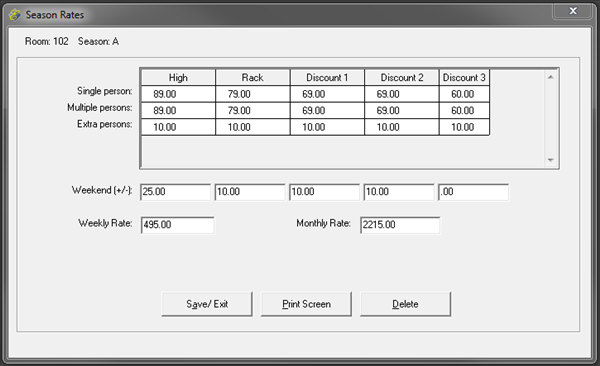 "Optional Revenue Charge Code" can be left blank if all room sales post under the same revenue (charge) code. The default room rental charge code is RC. Optionally you can designate a charge code such as RCC for this room. This is commonly used when a property has several types of accommodations such as hotel, campsites, or boat slips. It also can be used when rooms are at different locations such as RC1 for these rooms and RC2 for those rooms. The code must exist in Charge Codes . "Optional Package Revenue code" can be left blank unless a specific room revenue charge code such as RCP should post when a guest package applies to the guest staying in this room. "Connecting Rooms" is where you can specify up to four rooms that can be considered connecting or adjoining rooms. When a reservation's room is assigned to a connecting room or when a guest is checked into a connecting room, a pop-up will prompt you to select the listed rooms to connect to the room you are reserving or checking in. CAUTION: If you select a room to connect when assigning a room to a reservation or at check-in, the two rooms become a single entity. Example: Rooms 102, 104, and 106 are set up as connecting rooms in the system. You check a guest into 102 and the message at left pops up. 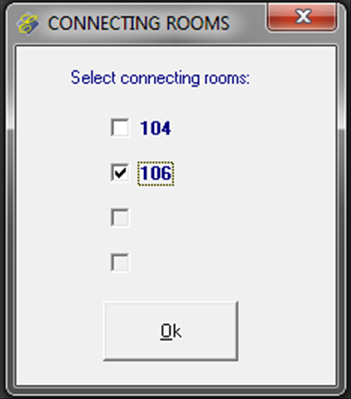 If you select 106 as connecting, then the two (102 and 106) become a single 'room'. There will be one folio; room and tax charges will post once and at the rate for the primary room (102). It is advisable to set up a specific rate code to apply to connecting rooms or manually adjust the individual guest's room rate. The secondary room (106) is removed from inventory. 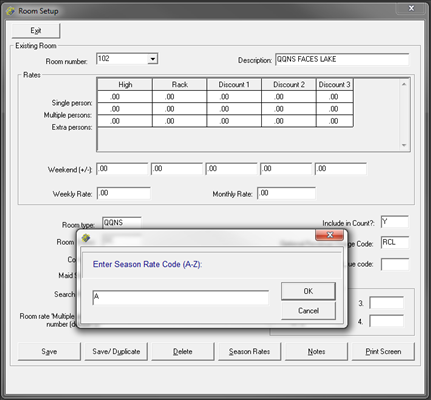 If you will enter rates for individual rooms instead of importing them with one button from the rates for the room types and you are using the Season Record , click the 'Season Rates' button at the bottom of the screen or press Alt+S. Enter the season code at the prompt as shown below. Enter the rates for each season just as you would in the 'Rates' section of this document. Remember, if all rooms of the same type have the same rate, you do not have to set up each room's rates individually. You can set the rates in Room Types and update the room prices with one button. When you are finished click 'Save/ Exit' or press Alt+A to save and exit. (Press Esc to exit without saving.) Select 'Season Rates' to enter the rates for the next season and continue until all rates are in the system. Click the 'Notes' button on the Room Setup screen (or press Alt+N) to add notes or additional information about the room. This information may be viewed on the Tape Chart by right-clicking the room number.